We arrive at Tokyo Narita airport feeling tired and stiff after 14 hours of minimal movement. We breeze through customs and pick up our baggage in what might be the cleanest airport I’ve ever been to. There are individual baby changing tables in every women’s washroom stall, equipped with it’s own washing station and everything. Fancy!It’s about 4am Toronto time, and 5pm Tokyo time, so we decide it’s best to get down to our hotel ASAP, settle in, and sleep so we can prepare for an early morning bus to Kyoto tomorrow. I’m eager to jump in and get on the famously crowded subway system, but Dad suggests taking a cab because of our baggage. Just to double check our options, we stop at information to find out the approximate cost of a taxi to downtown Tokyo. Does THREE HUNDRED AMERICAN DOLLARS sound like a lot to you? I’m pretty sure I would spend less cabbing from Downtown Toronto all the way to Elora for that kinda cash. Fortunately, there’s also a modestly priced airport bus that only costs ¥3,100 ($31). Call us peasants, but we opt for the bus. Everything is very organized. We choose our destination and are directed to a platform where we wait only about 10 minutes before a shuttle bus arrives. We are politely directed to stand right next to our suitcases in a single file line as we wait. There’s wifi on board, which requires a password and username, but it’s all in Japanese so I give up and decide to wait until we get to the hotel. Midway through our bus ride Dad is checking his “passport app” (which holds electronic versions of everything from hotel bookings to your Starbucks card balance) and realizes that he had been looking at the wrong hotel booking. We are only in Tokyo for one night, but are returning after our trek to do some more exploring. He had pre-booked all our hotels, and we have accidentally purchased a bus ticket to the hotel we are staying at in two weeks. We check a conveniently located map in the back pocket of the seat in front of us, and see that the hotels are significant distances from each other. Whoops. We get off at the first stop on the bus route which is a hotel AND connection to the subway line. A very helpful and bilingual concierge greets us at the bus and helps us maneuver our stuff through the busy rush-hour crowd-filled hallways of the subway entrance. 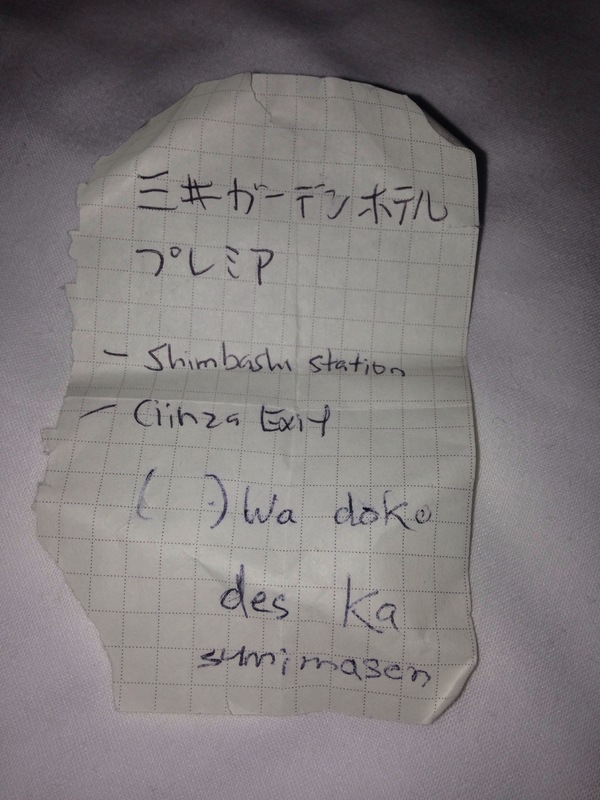 He writes our hotel name in Japanese on a small piece of paper, and writes our subway entrance/exit stops in English so that we can figure out where to go. I buy us two subway tickets which is a mini-nightmare because I can’t find the translation button for quite some time, but mostly due to the fact that the Tokyo system charges based on the distance you go, not just a quick $3 drop-n-go-wherever-you-want like I’m used to in most cities (never change, Toronto!). I buy two tickets that I THINK are the ones we need to get to where we’re going. Obviously, it’s not that simple. We follow our written directions and lug our bags into a relatively empty subway car in hopes that we’re headed in the right direction. I catch two people about my age speaking English to one another so I ask them if they can confirm that this subway will take us to Ginza Station. They’re vague and talk about other routes I COULD have taken but ultimately agree that this one will do the job. On a whim at one of the stops, Dad and I hop off the subway after he sees a sign saying “Ginza Exit” outside on the platform. We push through a crowd of people, saying excuse me and trying to maneuver all our baggage off before the doors shut. We follow signs to “Ginza Exit” and put our subway tickets into a machine that allows us to leave the subway station. Now we’re somewhere in downtown Tokyo…probably close to our hotel, but without the slightest clue as to what direction it might be. I see a western guy handing out pamphlets on the street and ask him for help. I learn that he’s been living in Japan for 3 years teaching English, but is originally from Toronto. It’s a small world, people. He writes down some phonetically spelt Japanese phrases like how to say “where is” and “excuse me” so that we could have an easier time conversing with locals on the search for our hotel. I’ll also mention that he is a total hottie. He google maps the hotel and points us in the right direction. We start walking but still don’t have a real concept of how long of trek this is going to be. After about 4 blocks I see what I think is a traffic cop (who actually turns out not to be a traffic cop, but still helpful) and ask him for directions. I show him the Japanese name of out hotel after saying “wa doko des ka” like the hot English teacher had taught us. This man motions for us to keep going another 3 blocks and turn left. We are almost there! When we get to the third block I can see the hotel name in lights just across the road. It’s been 3 hours since we landed and I’m more than ready to check in and get some sleep. We arrive in the lobby, wait in line, get to the desk and what does the concierge tell us? That we’re at the WRONG Mitsui Garden Hotel. We are booked into the Mitsui Garden Hotel premium, which is at another location. Shoot me in the face now, I just want to sleep. We give up and I hail a cab. The cab door opens automatically, our driver bows, and loads our bags into the trunk. The cab fare starts at ¥730 ($7.30) and I watch it to see how fast it climbs because I’m still dumfounded by the $300 airport taxi price we were quoted. We drive for like 3 minutes before we get to our destination and the meter is still at ¥730. I don’t understand, but I also don’t care. We are finally at the right hotel. Hallelujah. The lobby is on the 16th floor of the building. I have yet to discover what occupies the space between ground level and lobby. We check in with a very dainty concierge woman who places our credit card on a small silver plate, formally confirms every detail of our booking, provides us with a map, and directs us to the elevators. Oh lawdy I am ready for a nap! Our room is small and simply decorated, but with a gigantic floor to ceiling window looking out over Tokyo. All the lights are incredibly beautiful. Oh, and we get a toilet with a heated seat which is also pretty sweet. I dive onto the bed and pass out before I can even change into my pyjamas.